Each time Noah and the Whale announce a fresh set of dates or release a new record it seems their profile has risen once more. Having moved from folk-rock curios to mainstream success story, Noah and the Whale have released three albums with the latest, March's 'Last Night on Earth', spawning three radio-friendly singles that managed to bridge the playlists of Radio 1, Radio 2, 6Music and XFM, and more, summing up NATW's broad appeal. The band with a short, action-packed history that has included stints in the line-up from both Laura Marling and Emmy the Great, are currently completing their autumn tour with dates throughout October. Only the Leicester and Aberdeen dates now have tickets available at face value - all others have now sold out. Before returning to the UK in the spring, Charlie Fink and co are heading off to tour the US and Mexico throughout November. The band's brand of North Atlantic-inflected folky pop borders on Americana and has found an audience stateside, with tracks being picked up for TV shows including 'Cougar Town' and 'One Tree Hill'. 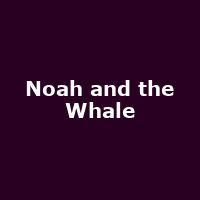 The new Noah and the Whale UK dates for 2012 begin in Sheffield on 22nd March, followed by gigs in York, Portsmouth, Southend, Plymouth, Wolves, Manchester and finally, their biggest gig to-date, London's Royal Albert Hall on 16th April. We will have tickets available for all dates when they go on sale at 9AM on Friday 14th October, priced from£17.50 (£22.50 for London). Ahead of the new dates, the band will also play two gigs rescheduled from this month when they appear at the Olympia Theatre in Dublin on 17th March and at the Newcastle Academy on 21st March. Tickets for the Newcastle date are now sold out, but tickets for Dublin are still available, priced €26.